Aiesha Lockett of the Office of Student Services powered up Rosa Park’s Friday morning on Sept. 22 with a rap song that raises awareness among students and families about the importance of attending school all day, every day. 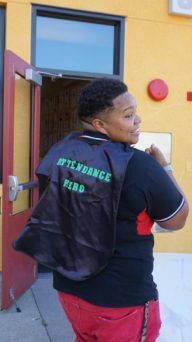 Dressed as “Attendance Hero” with a cape made by students at Jefferson, Lockett toured her rap song performance at BUSD schools during the second half of September as part of the district’s Attendance Awareness Month events. The lyrics, co-authored by Lockett and Student Services counselor Sophia Jones, use rap vernacular to capture the students’ imagination and attention. Lockett said the rap performance was added this year in conjunction with the Office of Student Services’ goal of engaging with students about attendance in innovative ways that encourage student initiative. From elementary schools to high schools, students made banners, participated in games and raffles, and held attendance contests in celebration of the month. The office also gives away tote bags, badges, and information resources about encouraging attendance and managing absences for parents and teachers. Lockett said that the key to improving attendance is to build relationships between schools and families. The state’s Education Code requires that students with three or more occasions of unexcused absences or tardiness should be reported to the district’s attendance supervisor. According to the district’s attendance report from May 2017, attendance rate as a percentage of enrollment improved by 0.19% from the 15-16 to 16-17 school year. Lockett said that a high attendance rate at as early as 2nd or 3rd grade can contribute to success in high school. “It’s always good to start early, but it’s never too late to turn the students around,” Lockett said.